You can find rice stick noodle dishes at almost any asian restaurant. 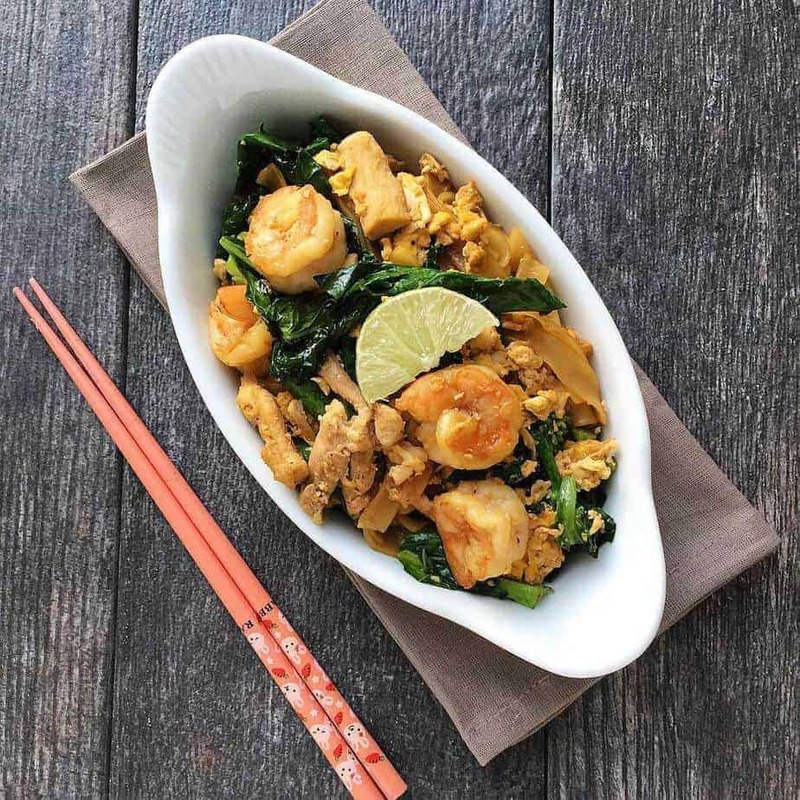 You probably saw this dish at Thai restaurants under a different name of Pad See Ew, and a similar dish at Chinese restaurants listed as stir fried flat noodle or Chow Fun. At an Indonesian restaurant it would also be very close, and be listed as Kwetiau. Depending on where you go, some of them may use Oyster Sauce, Sweet Soy Sauce and add different kinds of vegetables all making this dish look and taste different. Below is my easy flat rice noodle recipe. This is actually one of my favorite asian foods. This recipe uses simple ingredients and is very affordable. People will mix in many different types of meats and vegetables and I’ve made many variations myself. I like having a vegetable with a little bit of crunch to it, just my opinion. The most important key to this dish however is finding the right noodles and being careful not to overcook them. Chinese and Thai cuisine really share some of the ingredients but I think they can be set apart with the spice they use. The oyster sauce is apparently more Chinese however this is frequently seen as well with recipes of Asian food. The rice stick noodle is a comfort food for me. Yummy looking noodles! I love it when a lot of veggies are added to noodles and I also love my vegetable with a little bit of crunch to it. I am bookmarking this recipe to try later. Thanks for sharing. This dish looks really healthy and delicious! I love the freshness and combination of the ingredients! What a great photo that inspires too! I love to make Chinese food at home! It always taste so much better and fresher then take out! This sounds like an amazing recipe to whip up at home for a home date night. Um yummy. I have never made Chinese food before because I’ve always been intimidated by it but your recipe looks easy and sounds amazing. I’ll have to try this in the future and see how everyone likes it. I know I will love it. I am really lovin’ all of the different ingredients used to make this dish, and the photo is incredibly appetizing. I have never tried to make Asian noodles at home before. However, this recipe has inspired me to take a look at what our local grocery store has. We have a local Asian restaurant in the middle of the cool college area here. My husband and I had one of our first dates there, and I love ordering Pad See Ew there. They make it absolutely delicious. It’s my absolute favorite. This sounds extremely tasty! I have never tried Chinese broccoli before! It all looks nice. Okay I think I have found the perfect dish for my Sir’s lunch. He is really big on clean eating and I think this dish touches exactly what he wants. This dish looks amazing. I would love to try this. My mouth is watering just looking at the pictures. This looks delicious! Forget take out! I want to make this at home! I love Chinese but never make it. Now I can try to make your recipe. It looks so good and healthy too. We love Chinese food in my house. I actually have never made a dish with the stick noodles before so I will have to try this one. Thanks for sharing. I didn’t know it was this easy to make a chinese noodle dish! The ingredients are not hard to find and I love that it has tofu in it. We love Chinese food. This looks easy to do. I can’t wait to try this. wow this looks fantastic! I love chinese food but since moving to Iowa I haven’t found a go to spot yet. We will be trying this at my home! U always feel hungry when I visit your blog hehehe. This looks like another yummy treat for my tummy. Oh this looks amazing. This is more my husbands type of thing more than mine, but even I think this looks amazing. I’m so hungry now. I was thinking about going out for chinese tonight. I think I’ll make this instead! YUM. Oh, overcooked noodles are disgusting. Hubby tends to do that, so I’ll be preparing this yummy looking dish for the family. This looks amazing!! I love Chinese food and love getting new recipes! !